BLOCKADE Classic! First Person Shooter in an editable procedural cubic world. A large arsenal of weapons, 4 teams at the same time and up to 32 players on one map. A large number of game modes! Mixed (325) - 66% of the 325 user reviews for this game are positive. Launched European servers located in Germany. Fixed bug with the purchase of character skins after the purchase of "All weapons pack". Fixed bug with displaying payment history when switching menu tabs. Revised and increased the cost of Premium. This is due to the fact that now for the period of the Premium is issued free high-level weapons. In the future, weapons may change. Improved cheat protection. Work in this direction continues. 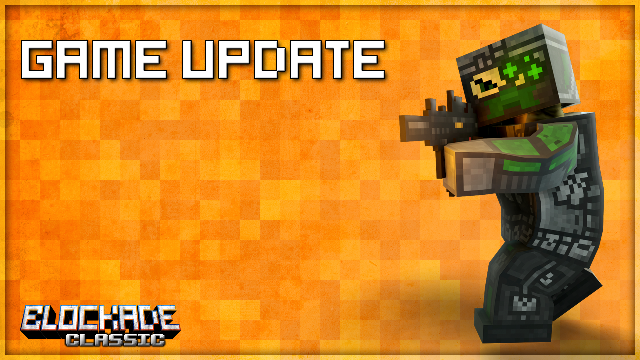 Running a bit into the future, we want to announce a rebalance of weapons, which will be implemented in the next update in the middle of next week. Not only the characteristics of the weapon will change, but also its prices, access by level, as well as the amount of ammunition issued for one purchase. Rewards for levels will be changed. First of all, we want to congratulate you on the International Day of Human Space Flight! May all your undertakings reach the same heights as Yuri Gagarin once reached! In honor of this momentous day in the game starts the action on the purchase of in-game currency, which will last until the end of next week. The description and conditions of the action can be found in the main menu in the coin replenishment section. The discount system when buying coins is added to the game. It is calculated depending on the amount of previously purchased coins and works for purchases of 100 coins or more (including action offers). The discount increases with every purchase. The ability to view your transaction history has been added to the coin replenishment section. Now, if coins didn’t come to you when buying them, you need to open the HISTORY tab in the coins replenishment section, find the pending transaction (marked in red) and click the UPDATE button. If the transaction was previously confirmed by you - the coins will be issued to you automatically. Changed the player's nickname change algorithm - now when you try to use non-printable characters in the nickname, they will be ignored. If the nickname consists entirely of non-printable characters, it will automatically be replaced by the Player+SteamID64. Also, this algorithm automatically processes the player's nickname when entering the game and when connecting to the game server. If you notice that your nickname has changed when entering the game or on the server, please use the printable characters the next time you change your nickname. We are continuing to fix bugs and errors in the game and want to thank everyone for their active participation in this! Thank you for your attention and good game! The game, which has become a legend for millions of players, is back! Dynamic cubic world with the ability to change the environment. In the arsenal you will find many prototypes of modern weapons, which will give you unlimited possibilities for choosing the methods of destroying the enemy. A large number of cool game modes in which you can shoot, destroy, build your own base, be the last of the survivors in front of a horde of zombies. Upgrade your weapon, customize your character, increase your in-game level, prove your superiority by entering your name in the TOP-100 rating of players from around the world! In this game, everyone can find something to their liking. A huge variety of maps created for you by the developers, as well as the community. In some game modes on one battlefield up to 4 teams can participate simultaneously. Clan battles in which there is only one goal - to become a champion!